Shopping is always better with friends. So are big savings! For the month of April, if you bring a friend with you, and they choose to become a new customer with us here at Rental City, you’ll both earn BIGGER bonuses! 2 Weeks Free! (We’ll give you 2 weeks on an existing account (or a new one!) And your friend will get the same on their new rental agreement! A $5 Gift card – we have a selection of gift cards for you to choose from for restaurants and other stores in our area! Take your pick! We’re here to help with budgets of any size. Rent-to-Own is a great solution for getting what you want now, without needing to make a massive purchase all at once. Don’t forget all of the other great benefits we offer too! Free delivery and set-up! Free service and loaners! Same day delivery (when possible). And if you move, we’ll move your rental item for you! We’ve also got our ‘See the Tax, Save the Tax!’ promotion happening – we’ll pay the taxes on any new rental! This is a great time to save. Hurry in. This extra bonus ends when April ends! 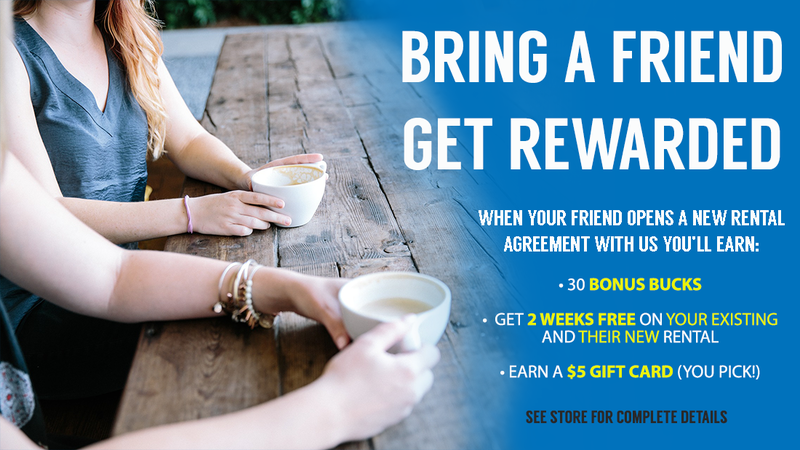 Please note: At this time, ‘Bring a Friend – Get Rewarded’ is available at our Huntsville location only.